The weather got really cold yesterday (It was 50 and it has been 80-90 degrees!). To help celebrate the new found cold-ness. I decided to make chili. 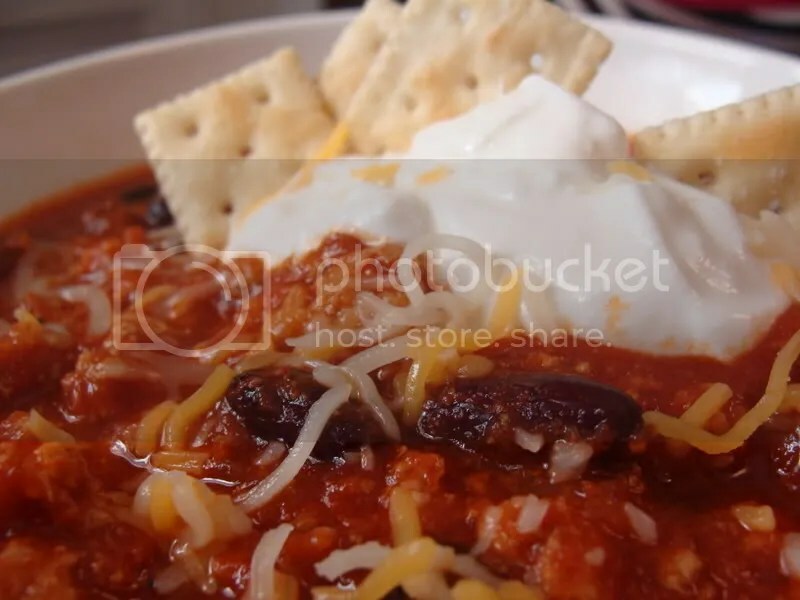 Chili is one of my favorite cold weather foods. It’s right up there with beef stew. My momma makes the best recipe also, so I called her to get her recipe. It turns out she uses a recipe from All Recipes that’s called Flatlander Chili. Based on her reccomendations, I made a few alterations. Place ground beef in a large, deep skillet. Cook over medium-high heat until evenly brown. Drain, crumble, and set aside. Add all ingredients to a large kettle. Bring to boil. Reduce heat and simmer for 1 to 1 1/2 hours, stirring occasionally. I added some shredded cheese, fat free sour cream, and some saltine crackers to mine. Don’t stick your nose up at the sour cream until you’ve tried it. It’s really really good. What do you do with cake scraps? If you’re like me, you hate wasting food. Every time I level off a cake, I wonder what to do with the “hump” that comes off the top of the cake. Sometimes John and I will eat part of it with leftover icing, but more often then not, it gets put in the trash can. Not anymore though!! 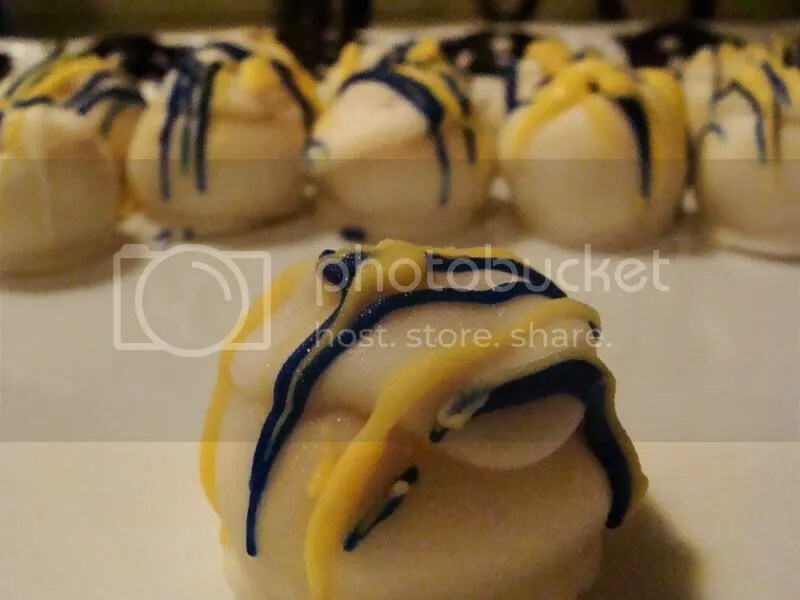 I decided to make cake balls! Just crumble up the cake really fine into a large bowl, stir in frosting until you get the desired consistincy. 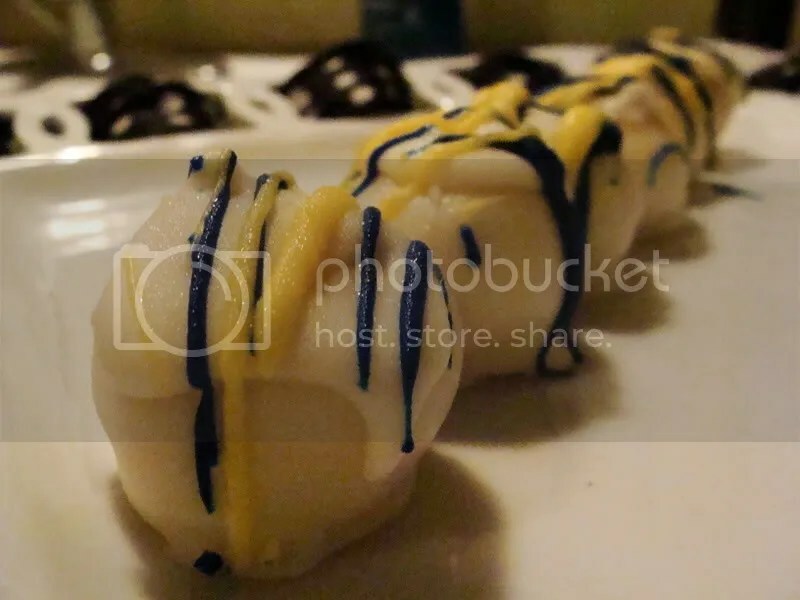 Roll into balls and freeze them. Then dip them in melted candy melts. Super easy! I sent these with John to a Coaches meeting so I decorated these in the football teams colors. Go Pioneers! John told me all of the coaches loooved them, so I will definetely keep them in mind the next time I have cake scraps. John prefers eating these frozen, so that’s where we store them. 2. One thing to keep in mind is that you have to work backwards. Whatever you want to show up on the outside of the transfer, do first. I started with black to outline the eagle, globe, and anchor. So, melt your first color of chocolate, color it and place in your icing bag. I was using disposable icing bags, so I just snipped of the very tip of the bag and didn’t use a icing tip, however you can use a #1 if you would prefer. 4. Once you get to your last color, fill it in like normal. When you are finished you will notice that the design is fairly thin. To make it easier to pick up, flood the back of the design with any color you have leftover. You just want to build up the back so it’s more stable. 5. Let set so it hardens. I put mine in the fridge for about 15 minutes. 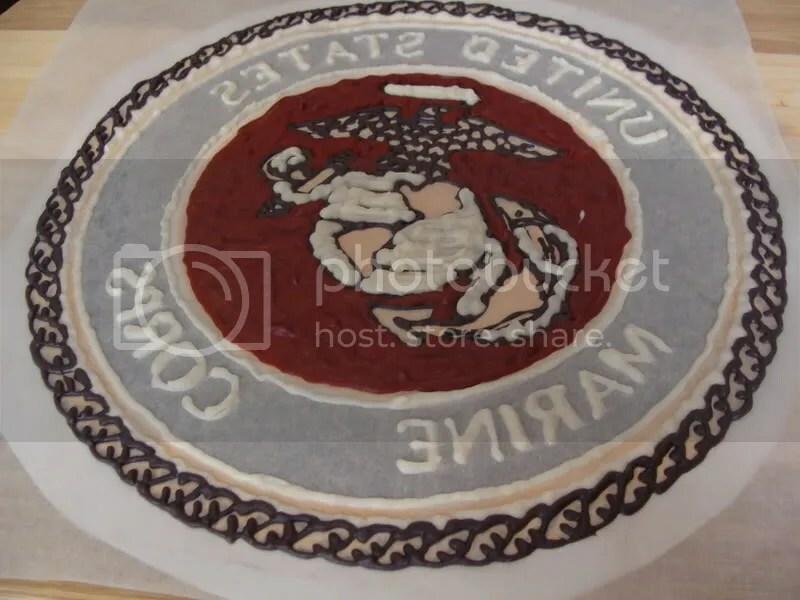 When you are ready to apply it to your cake. 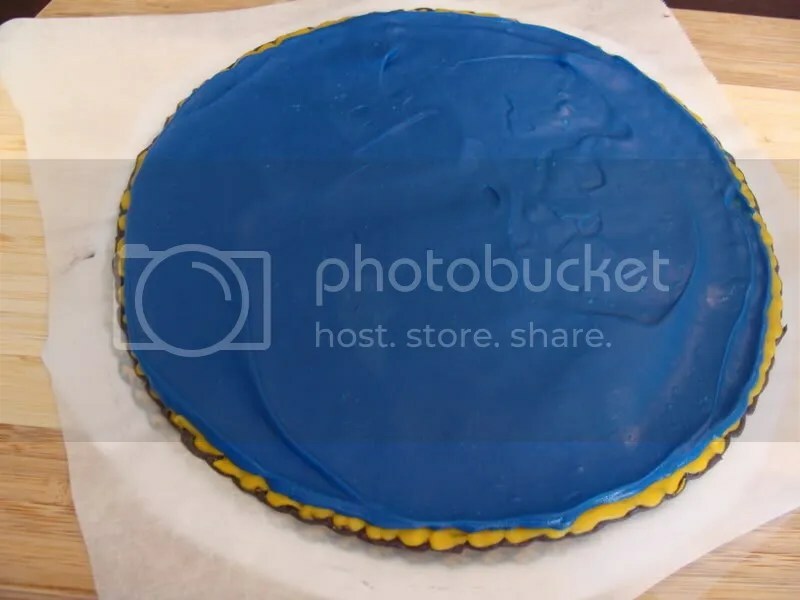 Pick it up carefully, flip the design over, and place it on the cake. Bonus Tip of the Day: Do you have problems filling icing bags by yourself? 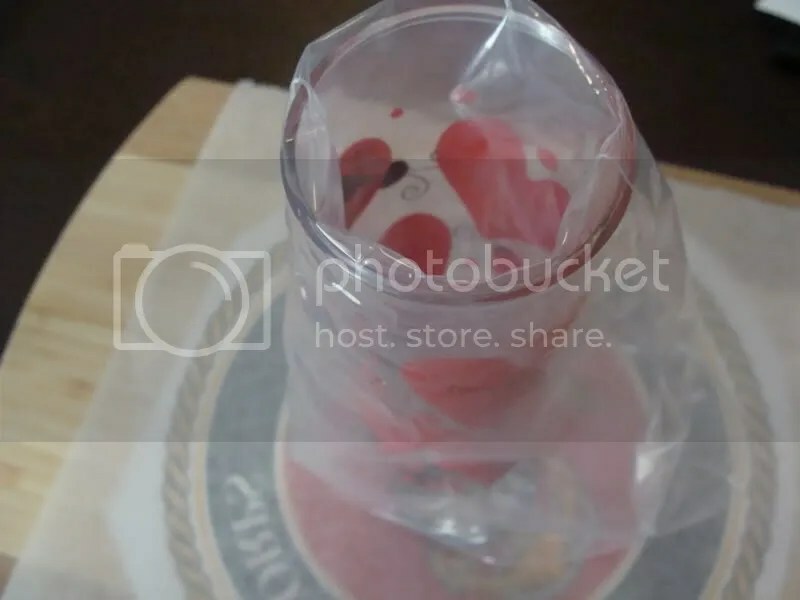 Place your bag in a tall glass and fill with ease! I hope these instructions are clear, if you have any questions just ask! I have been in a cake making mood lately. Since my dad looooves cake, I decided he would be the perfect recipient for this cake. I asked mom for a theme, but she was no help. 🙂 Sooo, I thought and thought. 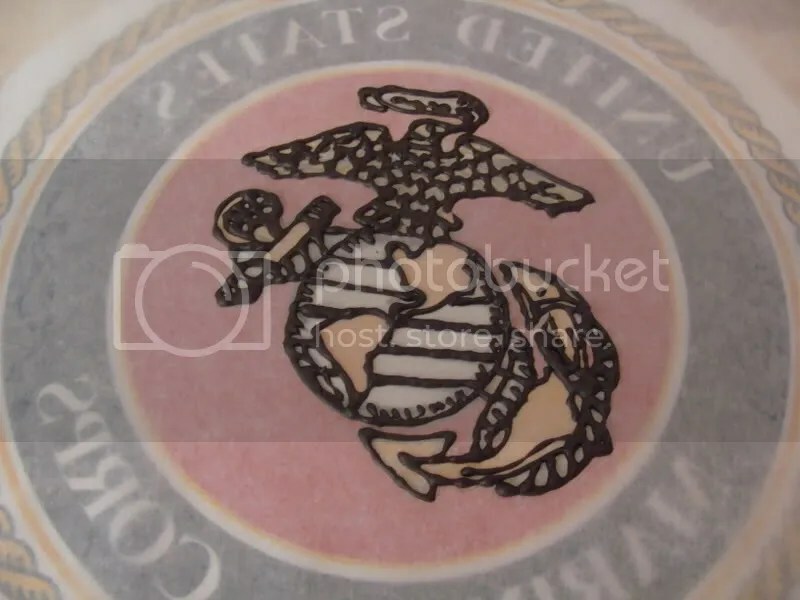 Remembering Labor Day was this weekend, I decided I would make a tribute to his years in the Marine Corps! To some of you, this may not make sense, but my entire life (all 24 years of it) I thought that Memorial Day celebrated military members who had already died, and that Labor Day celebrated military members who are still alive. 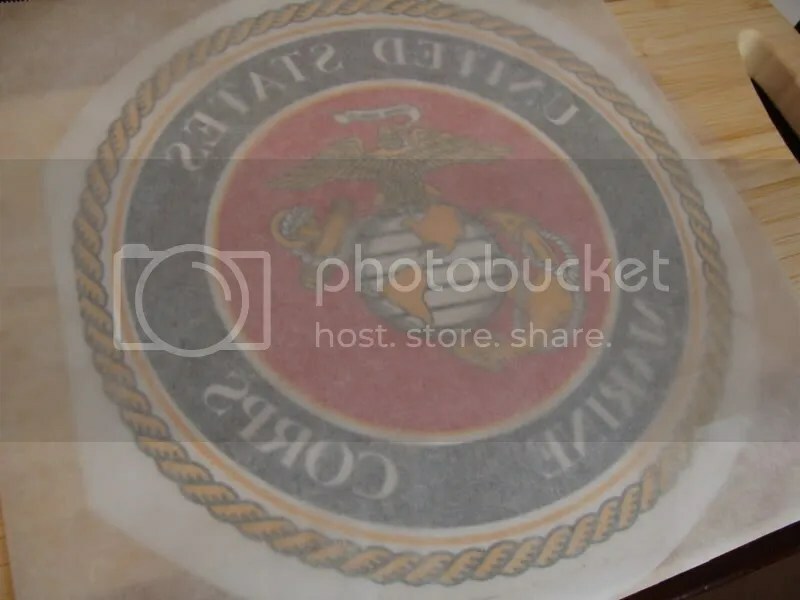 Thus, in my mind, in made since to make a Marine cake for my dad since he’s still alive. 🙂 But after mentioning this idea to several friends and getting some funny looks, I decided maybe I should look up the meaning of Labor Day… much to my surprise, my idea of Labor Day was completely wrong! To be honest, I still kinda think the “real” meaning of Labor Day is kind of lame, so I’m going to continue celebrating Labor Day the way I always have. So, thanks to all military members!! 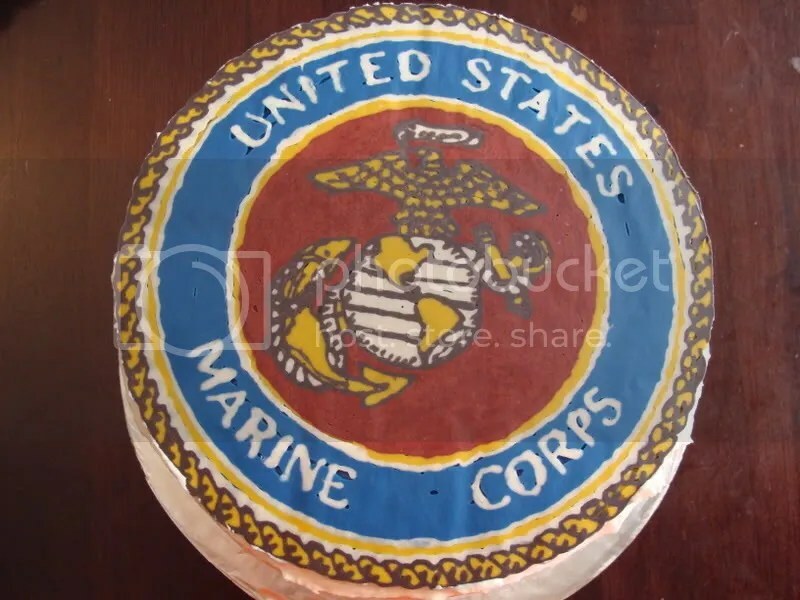 Here’s a cake for all the Marines, especially my dad! 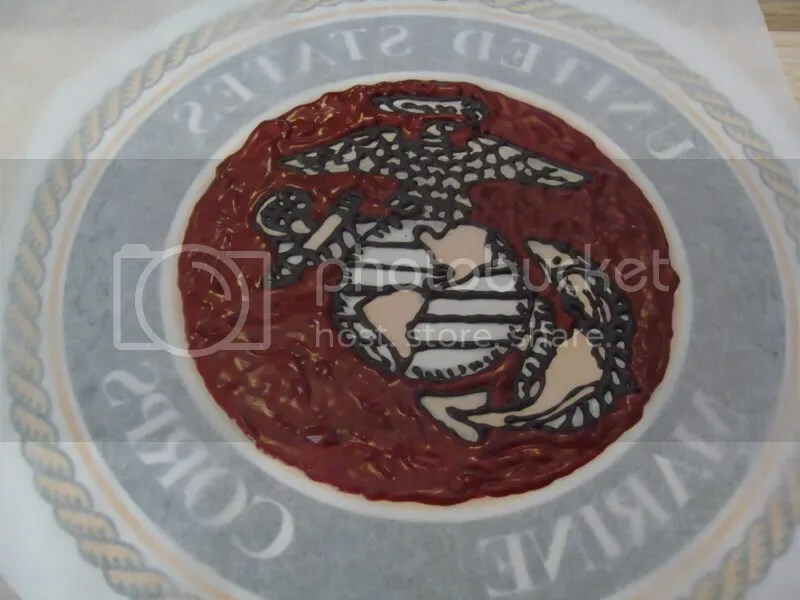 The Marine Corps “emblem” is a white chocolate transfer. Most people choose a simple design the first time, but being the dare devil I am, I decide to jump in with both feet and no life preserver. 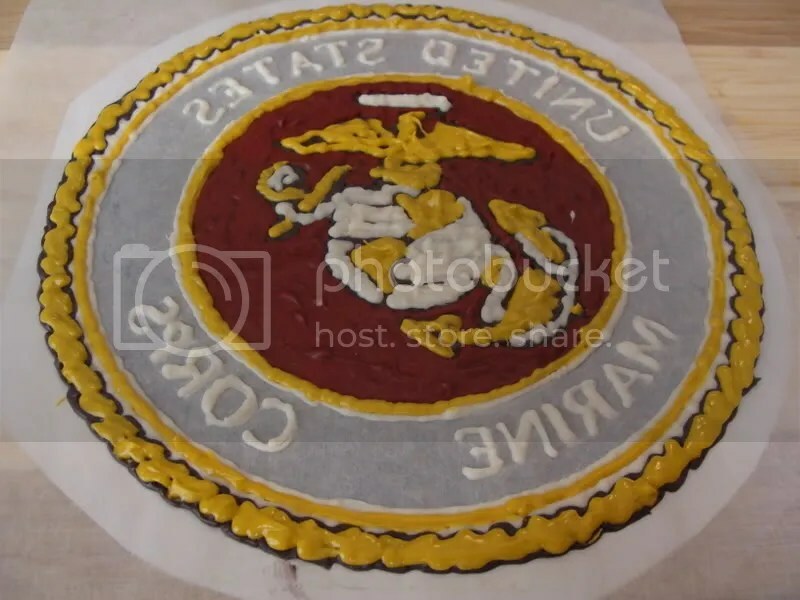 After working on the emblem for so long, I was tired of cake, so please excuse the awful, bumpy icing. Ooops, I gotta go. I’m babysitting one of the coaches kids during practice today and they just showed up. I’ll post a tutorial on how to do the transfer tomorrow. Promise!